Callings, written by Gregg Levoy is a expansive, well researched tome that, quite frankly, was one of those books that I needed to read right when I found it. It is so full of good content and anecdotes that I'm taking my time going through it so I can digest it all. Younger readers might find it a bit academic, however it will certainly open their minds to a broader world of literature, myth, and scientific study (mainly physiology). 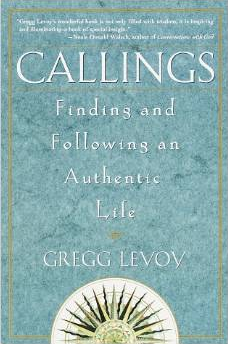 Mr. Levoy includes chapters related to travel, health, dreams, personal history, fear, and much more to weave together an exceptional piece of literature on finding and following an authentic life. I picked my copy up from the library and discovered about halfway through the book that the last 20 pages or so were not paginated correctly (and as a result, they are out of order). I thought this was a bit ironic considering the book's title. I subsequently asked the library if I could buy the book they declined. I went to a used book store to see if I could get a copy there and apparently they get asked for it quite often. Callings is a medium 300+ page read (small print). I'd highly recommend it. 5 out of 5 from me.